Adath Jeshurun Cemetery-ABC – Herman Meyer and Son, Inc.
A list of people buried in each section and their grave location is below the cemetery map. Names that are underlined have headstone images available to view. By clicking an underlined person’s name, you may view a photo of their headstone. 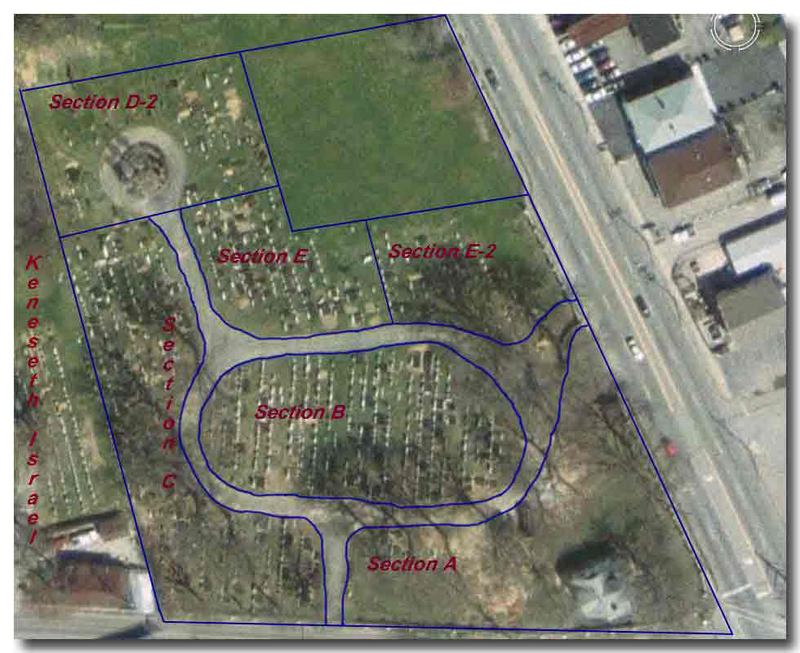 If you need further assistance with this cemetery, please contact Congregation Adath Jeshurun or Jody Bowling to assist you. S. B 58 1 b.
G. B 58 3 b. B. B 58 2 b.
JACOB B 57 3 b.
M. B 60 1 b.
N. E 73 B b.
W. B 58 5 b. B. E 73 C b.
BELLE B 58 6 b.
J. C 118 A b.
BELOVITCH C 107 E b.
BERNICE E-2 12 H b.
MILTON E-2 12 G b.
P. E 65 B b.
LOUIS E 65 A b.
M. B 24 2 b.
LOUIS B 24 1 b.
AL C 123 A b.
DAVID C 63 D b.
ISADORE C 5 E b.
MARY S. C 5 F b.
ALEX E-2 16 E b.
BERTHA S. E-2 16 F b.
DAVID B 53 5 b.
RITA A. D-2 51 A b.
PhD, CARL D 60 H d.
BIRDIE MAE C 84 A b.
MAURICE C 77 B b.
NORMAN C 77 D b.
SOPHIA B. C 77 C b.
ALFRED C 81 C b.
CHARLES E 52 C b.
ESSYE R. E 52 D b.
FANNIE R. B 116 2 b.
LOUIS E. B 115 3 b.
G. B 108 5 b.
ANNIE S. C 126 A b.
FAYE D. C 132 B b.
GOLDIE B. E 23 D b.
IRVIN C 147 C b.
LEO S. E 23 C b.
LOIS K. D-2 23 D b.
LOUIS FISH C 117 D b.
MIN F. C 147 B b.
MIRIAM L. C 109 B b.
BUCKY C 109 A b. ROSE B. B 31 3 b.
SAMUEL S. B 31 2 b.
SAMUEL C 132 A b.
SOL C 147 A b.
CHARLES D-2 4 C b.
EMANUEL B 20 3 b.
NELLIE B. B 21 1 b.
ABE B 64 4 b.
ALLEN J. B 74 2 b.
ANNA MASH B 94 4 b.
BEN B 75 1 b.
JOSEPH E-2 26 F b.
FANNIE C. B 64 6 b.
JACK B 64 1 b.
JOE B 93 6 b.
LOUIS B 64 5 b.
K. C 89 D b.
MAX C 89 C b.
TRAGER B 116 3 b.
SARA D-2 62 C b.
ALFRED C 65 A b.
BERNHARD B 97 2 b.
EDITH B. C 65 B b.
FRIEDA K. C 67 B b.
SIMONE D-2 44 D b.
JACK E 17 A b.
EDWARD D-2 68 A b. TROY D-2 60 F b.
FEDOR H. B 116 6 b.
HENRY D-2 60 E b.
ZERNICK B 118 5 b.
LAURA S. C 21 C b.
LEOPOLD C 21 B b.
SIEGMUND D-2 60 D b.
HERTZLE H. C 110 C b.
SOPHIE E. C 110 D b.
FRED E-2 12 E b.
IL'YA C 161 A b.
MORRIS L. E 35 A b.
BELLE H. C 46 A b.
ISADORE C 47 D b.
BESSIE M. C 152 D b.
LAWRENCE E 72 E b.
RAY F. B 45 2 b.
ROBERT J. C 152 A b.
MILLER C 163 G b.
WOLF C 152 C b.
BETTY S. B 96 1 b.
ELLIOTT D-2 69 C b.
ALEX E 74 C b. B. E 74 D b.
CLARA B. C 25 B b.
JEROME C 25 C b.
SAM C 25 A b.
KEVE C 58 A b.
MAURICE E 23 A b.
SARAH M. E 23 B b.
AUGUSTA C 10 A b.
HYMAN C 7 C b.
ABE B 88 2 b.
MEYER B 87 1 b.
SADIE B 88 3 b.
SAMUEL B 87 3 b.
YETTA B 88 1 b.
LEE B 98 5 b.
CHARLES B 98 2 b.
CLARA B 98 3 b.
JEROME B 98 6 b.
SCHWARTZ D-2 66 D b.
ERICH E 53 A b.
PAULA E 53 B b.
KATE C 129 B b.
ALVIN M. E 32 B b.
MILLIE C 155 B b.
SIDNEY C 155 A b.
ANNA C 91 A b.
BEN C 124 D b.
BERNARD E-2 20 B b.
CELIA C 117 C b.
DAVID C 44 C b.
DAVE E-2 19 D b.
DAVID B 89 6 b.
W. C 137 A b.
K. E-2 20 A b.
FANNIE C 111 D b.
GERTRUDE E-2 21 E b.
HARRY B 50 2 b.
HERMAN C 75 B b.
ISAAC B 57 4 b.
JEANETTA C 44 D b.
JENNIE B 90 4 b.
JENNIE B 50 3 b.
JENNY B 57 5 b. CHIC E-2 25 G b.
LOUIS C 85 C b. A. D-2 80 B b.
MAYME G. C 75 C b.
MAYTA E-2 25 H b.
MEYER B 73 5 b.
MINNIE C 90 D b.
MIRIAM W. E 39 B b.
M. B 95 1 b. ROSE W. E-2 20 C b.
SAM E-2 21 H b.
SAMUEL C 111 C b.
JOYCE B. E 98 B b. ROSE B 32 2 b.